The New Line showcases publicity material created by the leading designers of the 1930s for organisations such as Shell, the General Post Office and Fortnum & Mason drawn from the V&A’s National Art Library and three private collections. My research for the exhibition was focused on the designers, their particular working practices and any snippets of information that would add colour or context to the works. We were particularly interested in exploring how design was used to negotiate new ideas of modernity during this decade of social, cultural and political change and its role in explaining to the public how new technologies, such as the telephone, would fit into their everyday lives. During the 1930s, most designers were men and in the printing industry women were not even allowed to enter the trade as an apprentice, so I was excited to discover that one of the designers, Paul Beaujon, responsible for the pacifist pamphlet Peace Under Earth, was in fact a pseudonym for a woman, Beatrice Warde. 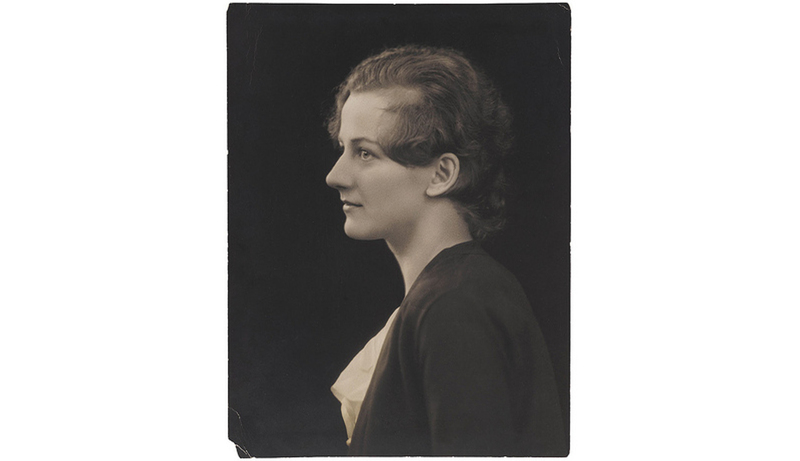 Beatrice Warde (1900-1969) was an expert in typography, a prolific writer and educator who lectured widely to printers, students and typographers. Born in New York, she was the only daughter of May Lamberton Becker, a book reviewer for the New York Herald Tribune and Gustave Becker, a composer and music teacher. In a transcript of a rediscovered 1959 interview, published online in Eye (no. 84 vol. 21, 2012), she described how her love of calligraphy as a child led to a deep interest in typography and explained that she used a ‘pen name’ because women at that time were not well respected in the printing profession; she decided upon a French name to be a little more ‘mysterious’. Installation shot taken in The New Line: Jobbing Printing Collection, De La Warr Pavilion. Open until 12 March 2017. Beatrice began her career by working as Henry Lewis Bullen’s assistant at the American Type Founders (ATF) Company’s typographic library, a repository that at its peak contained more than 16,000 books, periodicals and rare works from the printing trade. She later observed that the library didn’t have many visitors so it was the perfect place to research her interest in typography. Moving to London in the early 1920s with her husband Frederic Warde, a typographic designer who had also been Director of Printing at Princeton University Press, she continued to build on her base of knowledge, publishing her influential article, “The Garamond Types, Sixteenth and Seventeenth Century Sources Considered” under her pseudonym, Paul Beaujon in 1926. The article appeared in The Fleuron, the journal of typography and book arts edited by Stanley Morison and was based on her extensive research. It proposed that many typefaces previously attributed to Claude Garmont were in fact created 90 years later by Jean Jannon. As a result of this article, she was offered the part-time role of editor for the Monotype Recorder and was subsequently promoted to publicity manager in 1929, a post she retained until her retirement in 1960. A strong advocate for greater clarity in the way typography and printing were used in communications, the lecture she gave to the British Typographer’s Guild would become the basis of her influential series of essays published in the volume (1932) in which she asserted ‘that the most important thing about printing is that it conveys thought, ideas, images, from one mind to other minds.’ Reading her texts I was struck by how the force of her personality leaps off the page, she writes with huge enthusiasm, sincerity and wit. 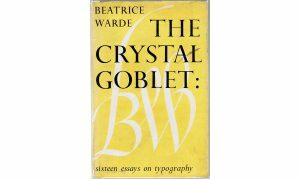 The crystal goblet: Sixteen essays on typography’ by Beatrice Warde. First edition published by Sylvan Press, London (1955). Beatrice was a trailblazer for women in her profession. She was first female (honorary) member of the Type Directors Club in 1960 and her broadside, This is a Printing Office, a rallying cry for the printing industry, has since been displayed inside printing offices all over the world and appears cast in bronze at the entrance to the United States Government Printing Office in Washington, D.C.
Printing Office. Source: Google images. For those who would like to find out more about Beatrice and how she inspired future generations of designers, typographers and printers, The V&A’s National Art Library holds a significant amount of Monotype material in their archive and her personal, family and professional papers can be found in the Cadbury Research Library at the University of Birmingham. I hope you enjoy finding out about this extraordinary ‘first lady of typography’ as much as I did.